I am a die hard fan of Chinese Cuisine. Whenever we eat out I always crave for Chinese food and my hubby is not so fan of Chinese food, so sometimes I compromise and sometimes he does. Even at home, I cook Chinese food more often than any other cuisine, off course after Indian Cuisine. One day, when hubby was out for dinner with his friends, I planned to prepare Chinese meal for me and my daughter. 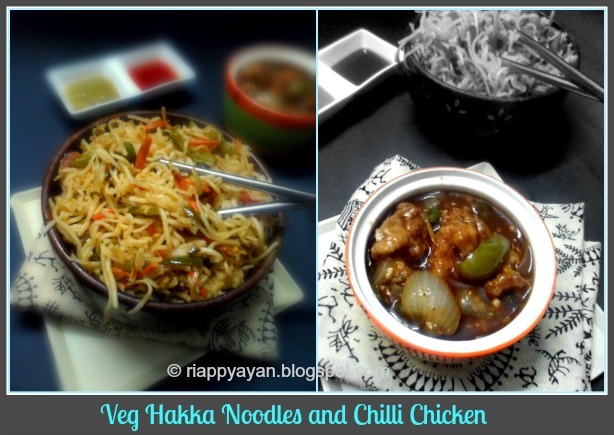 Made Veg hakka noodles and Chilli chicken combo, the two must-have dishes when the flavour is Chinese. And oh my, my taste bud got satisfied. Hakka cuisine is originated mainly from the southeastern Chinese province of Hakka. 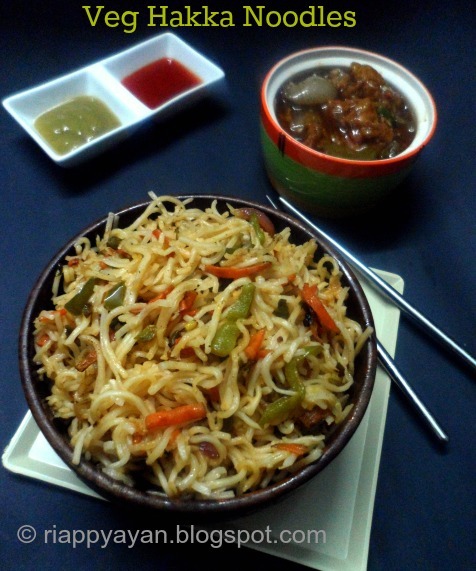 While original hakka cuisine is unknown to most of the World, this is the Indo-Chinese version of Hakka cuisine popularised by those Chinese people who got settled in India and running the Chinese Cuisine. 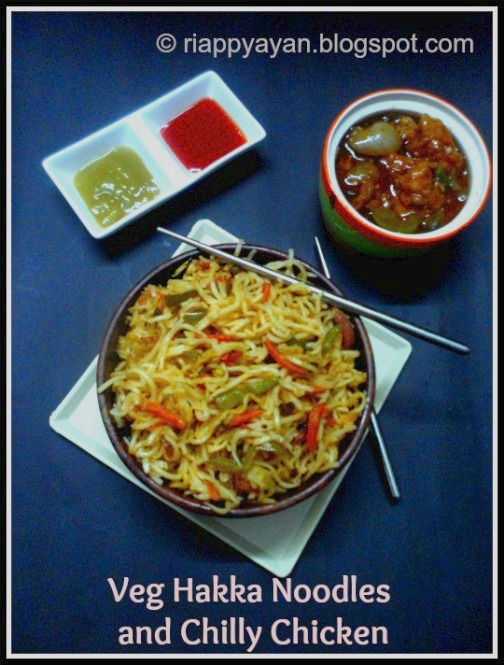 Veg hakka noodles is very easy-to-make and most popular dish from hakka cuisine. 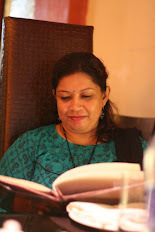 When it is served with a gravy dish like Chilli chicken/paneer or Chicken/veg manchurian, it can be a perfect meal in itself. Here, cooked noodles are tossed with garlic and certain vegetables along with some specific sauces like soy sauce, green chilli and tomato sauce on high heat. The hakka noodles available in market gives the best result for making the Hakka noodles. The noodles must be cooked very carefully to get the non-sticky texture of this dish. You can add choice of your vegetables,but mostly carrot, cabbage, green beans, capsicum, mushrooms are added to this dish. I added carrot, green beans and capsicum this time. Red Chilli sauce/tomato sauce : 1 tblsp. Cook the noodles in enough water with a pinch of salt. Cook just for 2-3 minutes or until noodles has just started to soften. Drain in a colander and rinse with cold water. Keep aside. Heat 1 tblsp. oil in a pan, cook the vegetables until they are just cooked but not overcooked. Keep aside. In the same pan, add 1 tblsp. oil, add minced ginger, garlic and spring onions. Then add soy sauce, green chilli and red chilli sauce/tomato sauce, mix well in medium heat. Immediately, add cooked vegetables and noodles. On high heat toss everything together, season with salt and black pepper. Keep on heat for approx. 2 minutes, then remove from heat and serve. Sprinkle some extra chopped spring onion on top and enjoy. Chilli chicken is one of the most popular and a must Indo-Chinese chicken side dish that is served in Chinese restaurants across the globe. Boneless chicken (fillets or cubes) pieces are marinated in soya sauce, chili sauce and pepper. Marinated chickens are then dipped in a corn starch-white flour batter and deep fried and then seasoned again in sauces to get the best Chinese style chilli chicken. The deep fried chicken pieces are served as an appetizer alone. 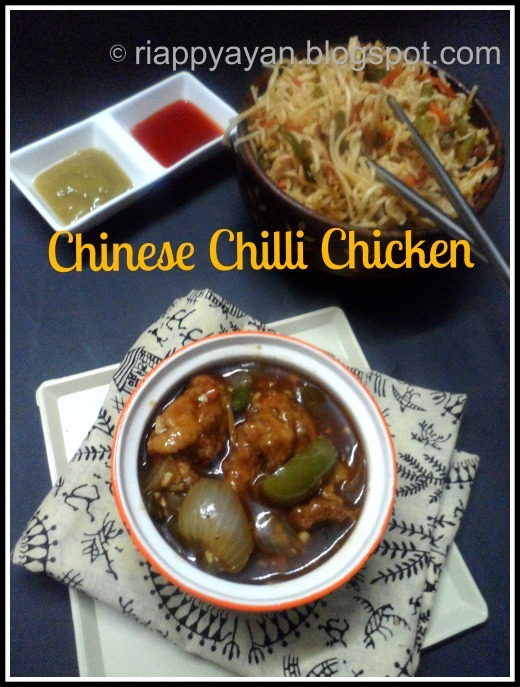 This spicy chilli chicken goes well with fried rice or Veg Hakka noodles/Egg Hakka Noodles. Cornstarch : 1 tblsp. + 1 tblps. Red Chilli sauce : 1 tblsp. Marinate the chicken pieces with the ingredients listed under 'For marinade'. Keep aside for at least 3-4 hours for best results. Chicken will become tender and tastier. Heat oil in a deep pan for deep frying. Make a semi-thick batter of cornstarch and flour with a little salt and red chilli powder/black pepper. Deep each chicken pieces in the above batter and add in the already heated oil. Do not overcrowd the oil. Fry chicken pieces in batches till they are golden brown. Drain on paper towel. In a bowl, mix together 1 tblsp. cornstarch and water. Add this mixture in the gravy to thicken it. Remove from heat when you have your desired consistency of gravy.